On a hot summer’s day in 1912, a team of builders were busy demolishing a building in the City of London. Numbers 30 and 32 Cheapside were houses that had been constructed in the years following the great fire, and were set to be replaced by a new building. It was whilst excavating a cellar beneath the houses with pickaxes that these ‘navvies’ made a truly astonishing discovery: a box containing over four hundred items of jewellery, dating from the late sixteenth and early seventeenth century. The Cheapside Hoard – by far the largest and most comprehensive collection of Elizabethan and Jacobean jewellery in existence – is now being displayed in its entirety for the first time in 100 years, at the Museum of London. The jewels themselves – necklaces, pendants, bracelets, earrings, rings, brooches, watches and fan holders – are stunning, no doubt about that. But what I especially enjoyed about this exhibition was what came just before, and just after, the hoard itself. To begin, there is a background to the jewellery-making industry that thrived in London in the Elizabethan and Jacobean eras, and to end there is an exploration of the mystery of the hoard’s burial, and speculation as to how it ended up hidden away for more than 250 years. Who buried it? Why did they bury it? And why did they never retrieve it? In short, nobody knows, but it’s fun speculating. In a single, large room, that contains the entire contents of the single, small box smashed open by those navvies a century ago, the curators have done a fantastic job in showcasing what are truly fabulous objects. Somehow, the way it has been spread out and categorised ensures that the sheer amount of jewellery that there is to see here never quite feels overwhelming, or starts to become monotonous. Much like a modern-day jewellers’ shop, there are tiny spotlights shone on it from all directions, to generate maximum shine and sparkle. The display cases can be viewed from all sides, allowing you to marvel at the exquisite craftsmanship from all angles. And then there are magnifying glasses, bringing the jewellery so close to you it’s almost as though you are touching it. And the fact that the tickets for this exhibition are on a timed entry basis is a good thing indeed, since had the space between the cabinets been even slightly more crowded than it was during my visit, then I would have spent quite a lot of the time waiting for someone to move out of the way before I could get a decent look at something. Clearly, those with an interest in jewellery will devour this. And those with a passion for the history of clothing and costume will no doubt appreciate the numerous contemporary portraits and items of clothing that have been included in the exhibition, to show how the jewellery looked on its Elizabethan and Jacobean owners. But even if you fit into neither of these categories, it’ll be hard not to admire the sheer quality of the craftsmanship, and the considerable skill that has gone into making these pieces. There is also, in between the glass cabinets, plenty of interesting information about the numerous stones, gems and materials that it’s all made of. We learn where they came from and how they got to England, and about some of the various superstitions and folklore that surrounded particular gems and stones. For instance, small pieces of malachite were worn around the neck, and placed around infants’ cradles, to ward off evil spirits, while amethyst was said to have a sobering effect on violent passions and drunkenness. I was particularly fascinated to learn the story behind a small gem known as toadstone. These small stones, shaped like toads, are in fact the fossilised teeth of an ancient fish called lepidotes, but in the seventeenth century it was believed that they must grow inside toads. Belgian mineralogist Anselmus de Boodt was so convinced of this fact that he stayed up all night waiting for a toad to belch one up, and once that had failed he tried burying a toad alive in a pot full of flesh-eating ants. The result of all of this is a curious mix of art, fashion, history, geology and natural history. The range of places from which the various gems and stones in the jewellery has come is truly amazing – among them Persian turquoise, Colombian emeralds and Bohemian opal. And these different stones from different parts of the world are usually combined into a single item, the finest example of which is probably the beautiful enamel scent bottle embellished with diamonds from India, opals from Hungary, rubies from Burma and pink sapphires from Sri Lanka (I’m starting to run out of superlatives to desribe the jewellery now, so I shall stop). It is possible that the jewellery in the hoard was made and collected from all over the world, by a collector who travelled extensively, but is also just as possible that they were mostly manufactured in London. This was, after all, the dawning of the age of global trade, and London was fast becoming one of the most important trading centres in the world. 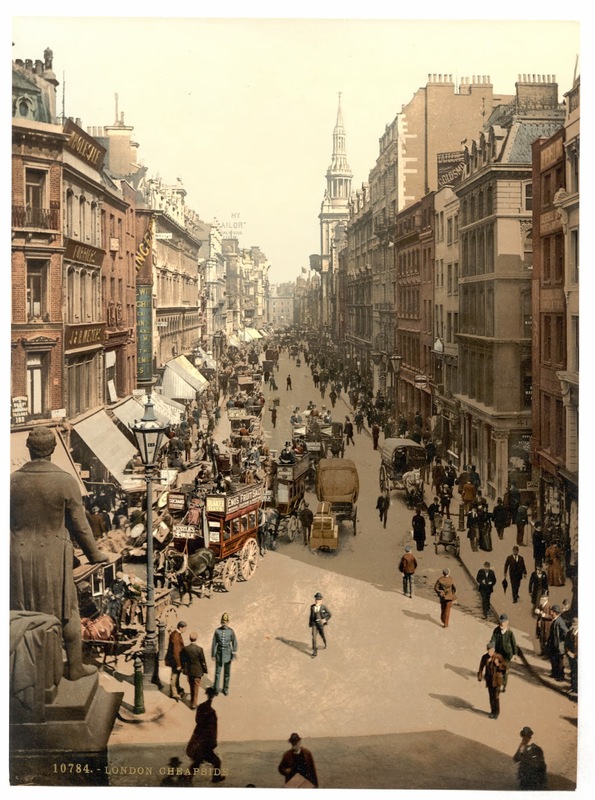 At the heart of this emerging trading centre was Cheapside, the most important shopping district in London before the development of the West End. The majority of the goldsmiths working in Tudor and Stuart London (all of them licensed and heavily regulated by one of the city’s oldest livery companies, the Goldsmith’s Company) operated out of Goldsmith’s row on the south side of the street near the church of St Mary le Bow (I walked past the site after visiting the exhibition, short walk from the Museum of London as it was, and found a Hugo Boss outlet, part of the One New Change shopping centre). Not only were the materials that the goldsmiths and jewellers of Cheapside worked with from all over the world, but the goldsmiths and jewellers themselves were often foreigners. Indeed, as the opening section of the exhibition highlights, the influx of increasingly skilled craftsman into London from elsewhere in Europe during the Elizabethan era caused considerable resentment amongst English goldsmiths, who felt their businesses were at risk. The mounting tension eventually led to the passing of a remarkable piece of law in 1587, that restricted foreign goldsmiths from displaying their stock in their windows to attract customers. It also forbade the goldsmiths themselves from being visible to passers-by on the street as they worked, whilst at the same time stating that their windows should ‘leave convenient light for them to work’. I found it very hard to imagine how these foreign traders got around that one. As the the full-scale reconstruction of the goldsmith’s workshop illustrates, to carry out such highly intricate work, plenty of natural daylight flooding through a large window was absolutely vital. Whether the Cheapside Hoard was the working stock of one of these goldsmith’s shops or some kind of personal collection that was hidden away is unclear. By the time the timber-framed Goldsmith’s row went up in flames in the summer of 1666, the hoard’s owner was either dead or unable to return to the site to attempt to retrieve it. And so it was that the people who lived and worked on the site from 1667 onwards were completely oblivious to the treasures that lay beneath their feet. What is known for sure is that the Cheapside Hoard’s burial took place at some point before 1666 and some point after 1640, which is the latest date that can be attributed to any individual item (a small, reddish stone commemorating the ennoblement of William Howard, who became Viscount Stafford in that year). With the period that played out between those years being one of the most turbulent in English history, various intriguing possibilities are thrown up as to who might have buried the hoard and why. In just twenty-five years, there was – deep breath – a Civil War between the king and parliament, the defeat and execution of Charles I, a military dictatorship and years of puritan-led oppression under Oliver Cromwell, the restoration of the monarchy under Charles II, the great plague of 1665 and finally the Great Fire of London a year later. It seems almost certain that a goldsmith working in Cheapside was caught up in one or several of these events. When the civil war broke out in 1642, all across England both the royalist and parliamentarian armies set about raising funds, and both sides quickly realised that London’s wealthy businessmen could have a pivotal part to play in helping their causes. With London quickly siding itself with the parliamentarians, any royalist sympathisers thinking of giving financial aid to Charles I would have had to have kept their dealings very secret indeed. The exhibition suggests that the jeweller who buried the Cheapside hoard was one such wealthy royalist, perhaps pawning off expensive items to help raise cash for the king’s army. A story acted out in a short film at the end of the exhibition sees the jeweller flee the country, along with other diehard royalists, at the end of the war. In the years that follow, his wife writes to him, begging him repeatedly to reveal the location of the remaining jewels, while he insists that he cannot in case his letters are intercepted by the government. Before he is able to return to London, and to his wife, he dies, and the location of the priceless box remains a secret for the next two and half centuries. Or, then again, the film ponders, perhaps the owner stashed it away one day and was unexpectedly killed by a falling roof tile. We will probably never know. The Cheapside Hoard: London’s Lost Jewels runs at the Museum of London until 27th April 2014. Tickets cost £10 for adults and £8 for concessions and can be purchased here (price includes voluntary donation). Jeweller Shaun Leane presented an episode of BBC Four’s Secret Knowledge all about the Cheapside Hoard, which you can watch on YouTube here. Tags: 17th century, Anselmus de Boodt, archeology, burial, Charles I, Charles II, Cheapside, Cheapside Hoard, Cheapside Hoard exhibition, Cheapside Hoard review, Colombia, coronation, coronation procession, Edward VI, elizabethan, England, English civil war, exhibition reviews london, exhibitions london, fashion, Goldsmith's Company, goldsmiths, Great Fire of London, Jacobean, James I, jewellery, jewels, London, London's lost jewels, Museum of London, Oliver Cromwell, parliament, St Mary le Bow, Stuart, Tudor, William Howard. Bookmark the permalink. Sadly, the exhibition at the Museum of London was last year but the post is well worth reading for a description of the incredible Elizabethan and Jacobean jewels discovered in the cellar of two Cheapside houses in 1912.